The Arc 5 represents Panasonic’s high-end line of electric shavers. Currently at its third generation, the Arc 5 family received 3 relatively minor revisions so far since its introduction in 2016 (more details in this article). 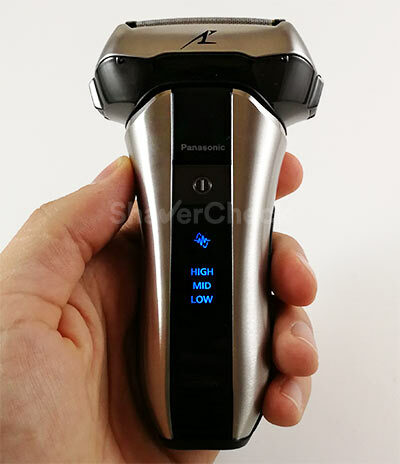 However, along with the latest makeover of the existing Arc 5 models, Panasonic also introduced a new and very intriguing model: a compact Arc 5 electric shaver, namely the ES-CV51-S (ES-CV70). The novelty stems from the fact that this model appears to be a full-fledged, high-performance electric shaver despite its very compact size. Apart from a couple of things that we’ll get to later on in the review, it shouldn’t be inferior to the regular Arc 5 models, which are arguably some of the best electric shavers you can buy today. With an impressive specs sheet, the Panasonic ES-CV51 is in my opinion the most interesting model that Panasonic has launched in recent years and in this review we’ll be subjecting it to a very thorough testing to find out if it really lives up to the expectations. Wrapup – Who should buy the ES-CV51 (ES-CV70)? 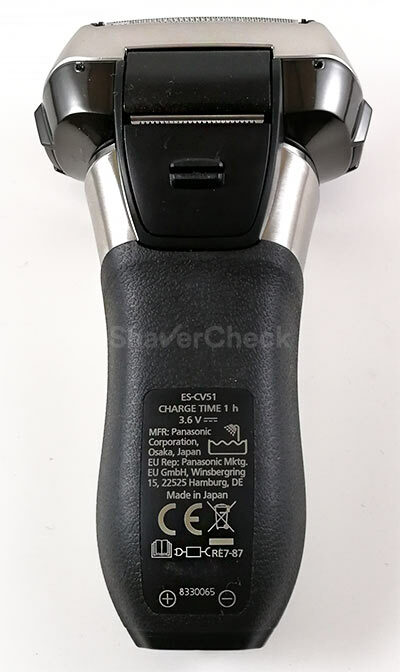 First of all, it’s important to note that ES-CV51-S is the model name of the shaver sold on the European market. 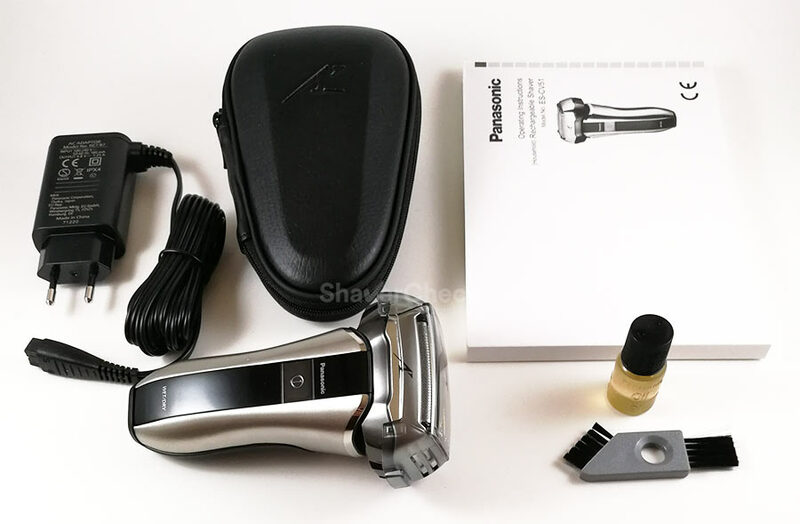 There is another identical shaver available in Asia, the ES-CV70-S. The two are exactly the same so you can very well consider this an ES-CV70 review if that’s the model available in your area. Again, the Panasonic ES-CV51 and ES-CV70 are absolutely identical, no differences whatsoever. As the Arc 5 moniker suggests, the ES-CV51 features a 5 blade shaving system, the very same that is found on its bigger siblings (like the ES-LV9CX-S/ES-LV9Q etc). Compared to the previous generation Arc 5, the elements that immediately stand out are the two golden comfort rollers that should make the shaver glide smoothly over the skin and improve the comfort of the shave. We’ll see how good they are in the performance section of the review. Panasonic states that the new Power Quick Lift cutter is an improved version of the previous Quick Lift element that, to be honest, wasn’t that great with longer hairs. On a first inspection it appears to be pretty much identical to the older one, but we’ll see how it performs later on in the review. In typical Arc 5 fashion, out of the 5 cutting elements, 3 have the cutters integrated into the foils block itself, while the two reverse tapered foils have two corresponding inner blades that are exposed once the foil frame is removed. The two inner blades of the Panasonic ES-CV51. The blades are Panasonic’s well-known 30-degrees nanoblades, some of the best in the industry in my opinion. Machined with extreme precision, they feature an aggressive 30-degree bevel that ensures a very efficient cut, without yanking or pulling the hairs. As a result, Panasonic shavers are arguably the closest shaving electric razors on the market right now. The downside of this is that they’re not the most comfortable, especially during a dry shave. 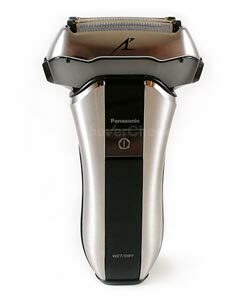 With this new shaving head the comfort during the shave should be greatly improved, at least according to Panasonic. Even though Panasonic tends to fit less powerful motors to some models in the less expensive Arc 3 and Arc 4 lines, with the new compact Arc 5 ES-CV51 and ES-CV70, it didn’t make any compromises in this regard. They come with a very punchy 14 000 cycles per minute motor, the fastest you can find on any electric shaver at this moment. This is a noteworthy detail on a normal size razor and even more impressive on a travel shaver like the ES-CV51 or ES-CV70. The powerful motor should ensure excellent performance even when the shaver is used on a very coarse beard. The ES-CV51-S is fitted with a special sensor that reads the density of the beard and adjusts the power output accordingly. While in theory this sounds good, in practice it doesn’t work particularly great. I’ve used other Panasonic models that were fitted with this technology (including the new Arc 3) and I found it to be inconsistent and of little to no use. 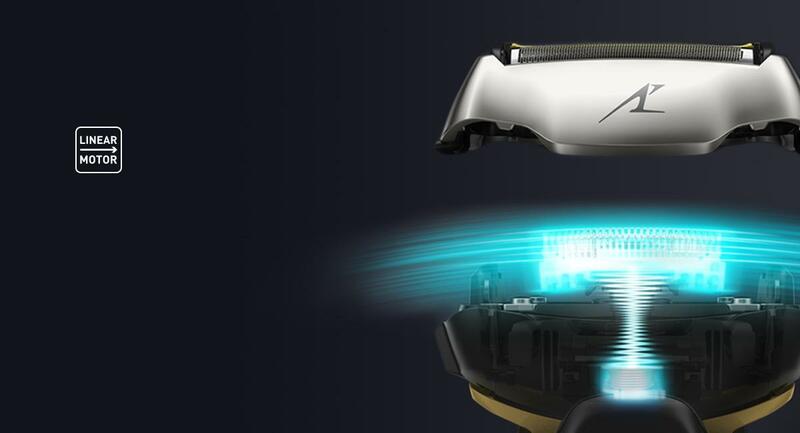 While with the second generation Arc 5 you had the option to disable the sensor and shave in full power mode, you cannot do that with the ES-CV51 or any of the latest Arc 5 models. As all modern Panasonic shavers, the new ES-CV51 is fully waterproof and suitable to be used in the shower or with your favorite shaving cream or gel. Panasonic shavers are fantastic wet/dry performers and I don’t expect this one to be any different. The ES-CV51 can only be used cordless as a safety precaution. 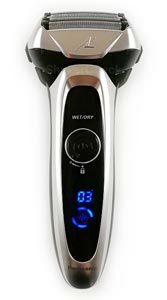 For that it’s fitted with a rechargeable Li-Ion battery that should provide up to 45 minutes worth of shaving time. There’s a handy 3-minute quick charge function as well. The Panasonic ES-CV51 comes in a rather slick and compact box made out of thick cardboard and embellished with traditional Japanese bladesmithing images. The highlight of the included accessories is of course the new leather hard travel case. It looks amazing and simply oozes quality. Up until now, Panasonic would only give you those flimsy faux leather or textile soft pouches that didn’t offer much protection. The new hard case is a significant upgrade in quality and a lot more practical. Also, it’s worth noting that it’s only available with the compact models (ES-CV51 and ES-CV70) and the range-topping ES-LV9CX-S that’s only available on the Asian market for now. The small bottle of oil is also a very welcome addition and I’m glad Panasonic decided to include it as well. 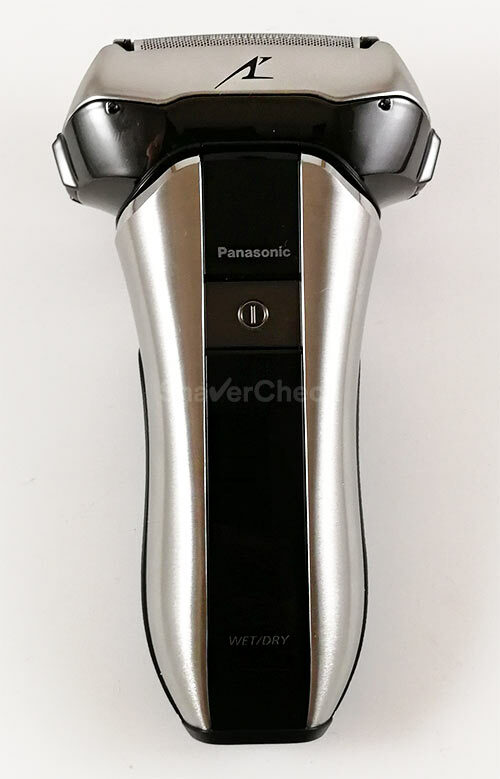 Panasonic shavers have always been on top in terms of build quality and with the latest Arc 5 generation, they have taken this one notch higher. The top of the line models now feature premium materials like brushed aluminum and make the shavers from the competition pale in comparison (for example, the Braun Series 9 with its shiny plastic body). It was a very pleasant surprise to see that Panasonic didn’t make any compromises with the new Arc 5 compact shavers: the same brushed aluminum is being used here as well and it gives the shavers a very classy look and a high-quality feel when held in hand. 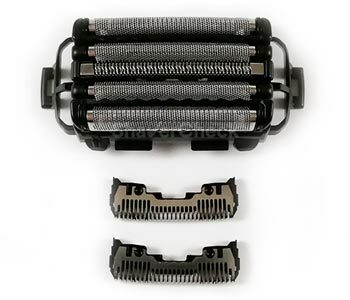 The metal extends from the front to the sides and all the way to the back of the shaver. The polished chamfered edge at the top is a really nice touch as well. I personally love the color scheme with the silver/beige that contrasts nicely with the black parts. I think Panasonic really nailed it with the design of the ES-CV51 / ES-CV-70. The front part of the shaver has a central glossy plastic strip that houses the ON/OFF button and right below it there’s a pretty basic LED display that shows some useful info. Even though it looks really good, glossy plastic tends to get scratched pretty easily and my review unit is already showing a few scratches on that glossy strip despite the fact that I was very careful handling the shaver. The power button also doubles as a travel lock; in order to activate it you must turn the shaver ON and then press and hold the button for 3 seconds. The locked state will be indicated by a padlock icon on the LED display. Pressing and holding the button for 3 seconds will unlock the shaver. On the back of the ES-CV51 there’s a matte, textured rubberized insert that extends to the sides as well and ensures excellent grip. The brushed metal feels quite grippy as well. Also on the back of the shaver we’ll find the pop-up trimmer that can be deployed by pushing the slider up. The regular size Panasonic shavers have a more complex slider that features 3 positions. Apart from extending the trimmer, it can also lock or unlock the shaving head. Since the ES-CV51 and ES-CV70 have a fixed shaving head, the slider lacks the two positions for locking and unlocking the head. The new full-size Arc 5 shavers have a very complex mechanism that allows the shaving head to move and swivel in many directions and it would have been impossible to implement on a compact model like the ES-CV51. The shaving head of the ES-CV51 is quite massive with the 5 independent cutters. Panasonic tried to compensate this by making the frame that surrounds it as narrow as possible. The foil frame is made out of plastic and has a matte finish that resembles metal. The bottom part of the shaving head features a glossy treatment. 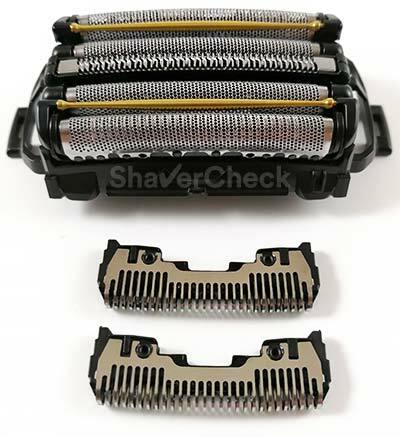 The frame is extremely easy to remove by pressing the two tabs located on the sides of the shaving head. It snaps extremely easy and precisely back into place with a very reassuring click. Everything about the construction of this shaver just feels very robust and refined at the same time. 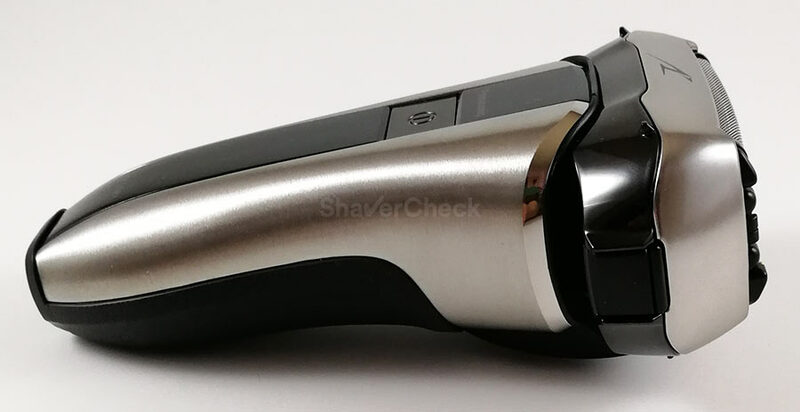 Since it’s very compact, the ES-CV51-S feels very good in the hand and the rubber and brushed metal ensure a very secure grip even when the shaver is dripping wet. The shaver is surprisingly hefty for its size and I personally thought that it would be lighter. If I were to nitpick, I’d say that it’s a bit top heavy and its weight is not distributed evenly. However, this can only be a problem if you don’t hold it firmly in your hand as it can capsize and you could actually drop it. Another minor, but nice touch is the ventilated plastic cap that allows water and moisture to evaporate. It’s great to see this type of attention to details. Overall, the ES-CV51 scores extremely high in the build quality and ergonomics department and it’s without a doubt the most premium feeling travel/compact shaver you can buy today. Unlike most other compact shavers that are powered by regular AAA batteries, the Panasonic ES-CV51 comes with a rechargeable Li-Ion battery. It’s also true that the power output of those shavers doesn’t even come close to the 14 000 CPM motor of the ES-CV51 (or its price tag). So a rechargeable battery was probably the only solution. And that’s perfectly fine normally, but in this case I was a bit concerned about the battery life. Since the body of the shaver is so compact, fitting a larger battery would definitely be a challenge. I don’t know exactly how they pulled this off, but the battery life of the shaver is excellent. During my tests the ES-CV51 was at least as good as the other larger Panasonic models in this regard. I was able to get at least 8 or 9 shaves from a full battery, which is more than enough in my book. It also means that in most cases you could actually leave the cord at home when traveling (assuming the shaver will be fully charged upon leaving, of course). And this brings me to the matter of charging cords; every manufacturer uses its own proprietary cable. It would be much more beneficial to us, the users, if they would simply use a USB type C port. Almost all modern smartphones, laptops and tablets have adopted that standard and it’s about time electric shavers follow suit. Once this happens we won’t have to worry about charging our electric shavers anymore. Speaking of which, it takes just under an hour for the ES-CV51 to go from 0 to fully charged. Being a wet/dry shaver, you cannot use it while it’s connected to the mains. A handy 5-minute quick charge will however provide enough juice to complete one shave. The battery status indicator only has 3 levels: Low, Mid and High. It’s not as useful as a 5-level display, but it is what it is. Overall, the ES-CV51 fares excellent in the battery life department. Let’s now get down to business and see how good the Panasonic ES-CV51 really is. As I mentioned previously, this model is identical to the ES-CV70, so the review will be relevant in the case of both. I have been using the ES-CV51 exclusively for almost 3 weeks to get a good idea on its performance and to see if it could really be a viable option as my main shaver as well, and not just for traveling. I shaved daily, every other day and every two days, using it both dry and with shaving cream. Overall, the performance of the Panasonic ES-CV51 was great. It managed to surprise me quite a few times and I will try to present my experience in an objective, unbiased manner so you can decide if it would be a good fit for you as well. I’ve said it on many occasions that Panasonic shavers currently provide the closest shave of any electric shavers brand out there. 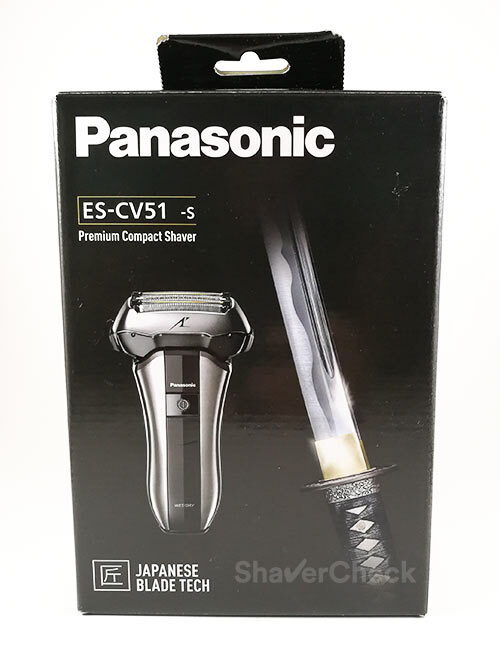 Given that the ES-CV51-S uses the same blades and foils as Panasonic’s top of the line Arc 5 shavers and it even has the same powerful motor, I had very high expectations. And I’m glad to say that it didn’t disappoint. In fact, the ES-CV51 provided some of the closest shaves I ever got from an electric shaver. For me it’s usually very difficult to get a really smooth shave above the upper lip and on the chin, but this tiny razor worked great. It’s also extremely fast and powerful, so it will be suitable even for very coarse facial hair. It really is a proper Arc 5. The only compromise that had to be made is the fixed shaving head. But it’s not that big of an issue. The ability of the shaving head to move up and down is quite handy as the foils (and head) will remain in contact with the skin at an optimal angle (90 degrees) when shaving different areas of your face. 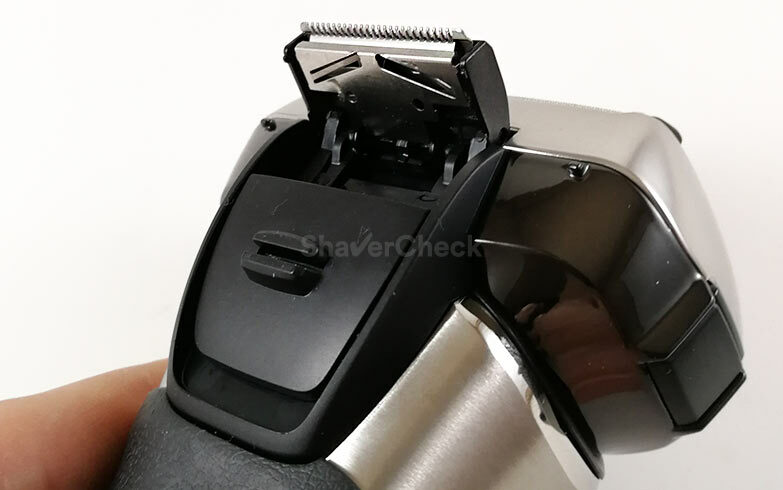 Since the ES-CV51 lacks this feature, you’ll have to adjust the angle of the shaver relative to the skin a lot more often. But being a very compact and maneuvrable shaver, this really isn’t a major drawback. Getting back to the closeness of the shave, the ES-CV51 was really good even during a quick dry shave. Adding a pre-shave yielded even better results, especially when shaving right below my nose and on the chin where I have really thick facial hair. However, this shaver excelled when I used it with shaving cream. In my case the closeness was similar to what I would get from a DE razor. I only used Nivea and Speick, two of my favorite shaving creams; they’re inexpensive, widely available and work great. If you’re not totally averse to using shaving creams with electric razors, I highly recommend them with this shaver if you need a really close shave. As for downsides, the 5 cutting elements require quite a bit of force to be depressed and they don’t move as easy as the ones on a Braun Series 7 or 9 for example. It’s the same story with all Panasonic shavers, not just with this one in particular. This, coupled with the fixed shaving head means that you’ll need to do a bit of extra work to maintain optimal contact with the skin, especially on the jawline and right below it. The size of the shaving head is not an issue for most of the time. However, I did miss the maneuvrability of a 3-blade razor when shaving right below the nose. But in the end, I managed to get a very close shave despite bumping the foil frame a few times against my nose. While Panasonic shavers excel at providing very close shaves, it’s usually a different story when it comes to comfort. With the current technologies, an electric shaver simply can’t be the best at everything and a trade-off must be made, be it in closeness or comfort. With the new Arc 5, Panasonic did a great job and reduced this trade-off to a minimum. The ES-CV51 is surprisingly comfortable and it’s actually the best Panasonic I’ve used so far in that regard. It’s also the first one that I can confidently use dry without any worries. Previous Arc 5 shavers were a bit too aggressive if you had sensitive skin. I would often get a rash and experience discomfort during and after the shave. With the ES-CV51, this was minimal and only noticeable on the neck where I have very sensitive skin. I cannot give credit for this improvement solely to the comfort rollers as the design of the foils was modified as well. The foils did get a bit warm, especially toward the end of the shave, but not to the extent of causing discomfort. So at least for now, it’s all good. Sometimes after a few months of use, some Panasonic foils will start to get quite a bit warm compared to the ones on a brand new shaver, but I don’t think it will be the case here. And even so, lubricating the cutters will reduce the heat significantly. So the included lubricant will come in really handy. Using a pre-shave made shaving even smoother, but again it was during a wet shave where this shaver shined. It was supremely comfortable and I can confidently recommend it even to men with sensitive skin. Beard density sensor — does it work? The Panasonic ES-CV51 features a special sensor that detects beard density and alters the power of the motor. You can really notice it as the noise of the motor changes in intensity as you’re shaving different areas. I cannot say with certainty that it makes a difference as there is no way of deactivating it like on previous Arc 5 models. But in my opinion the advantages of this technology are minimal and I wouldn’t mind not having it. 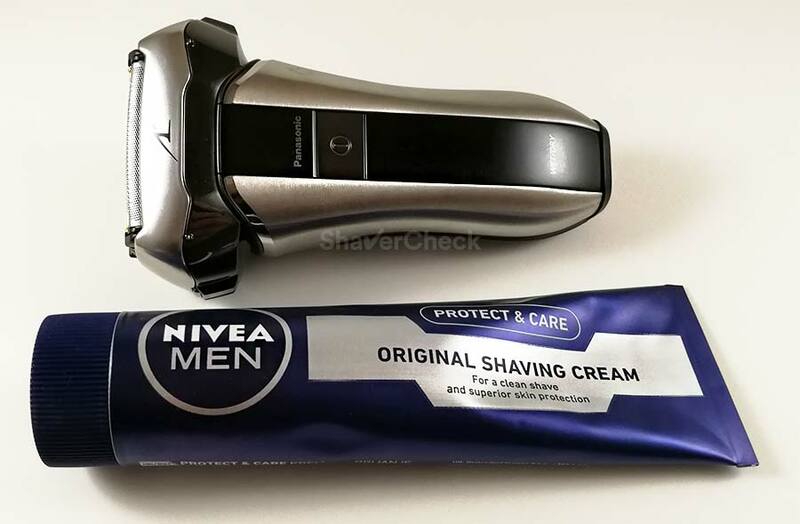 Also, during a wet shave the sensor gets confused and the shaver operates at maximum power at all times, which isn’t necessarily a bad thing. Apart from being a bit too harsh for sensitive skin, one of my main gripes with the previous Arc 5 razors was shaving a two or three days beard, especially if the hairs lie flat on the skin or grow in different directions. Panasonic shavers just can’t capture them as efficiently as a Braun Series 9 or even a Series 7. The latest Arc 5 models, including the compact ES-CV51/ES-CV70, come with an updated design of the foils that should improve the shaver’s performance with longer hairs. Unfortunately, after using it on a three days beard I must say that they’re still pretty average at best in this regard. It’s particularly obvious on the neck, requiring multiple strokes to capture all those flat lying hairs and the direction of the stroke must be precisely against the grain. But at least it won’t irritate your skin as previous Panasonic shavers would. So despite Panasonic’s claims of using an improved trimmer for catching long, flat hairs, this razor is pretty much on the same level as the previous generation Arc 5. The workaround would be to simply shave more often; the ES-CV51 performs great on shorter facial hairs, so shaving daily or every other day would yield the best results. If that’s not an option, then a Braun Series 9 or even 7 will be better suited for the job. But keep in mind that in most cases those won’t shave as close as the Arc 5. The new Arc 5 compact models are fitted with the same popup trimmer we’ve seen on all Panasonic shavers. It’s positioned on the back of the shaving head and can be extended via the slider located right below it. The sliding action is very smooth, unlike the one on other shavers that feels very jerky. I have to give Panasonic props again for including a proper trimmer; it’s adequately wide, having the exact same with as the trimmers found on the rest of their shavers. Most other travel razors only have a tiny (and fairly useless) trimmer or none at all. Since it’s positioned close to the top of the shaving head, it’s not obscured entirely and you can use it fairly well. However, removing the foil frame and the two inner blades will make it a lot easier to see what you’re doing. For trimming and shaping your sideburns it works great and you can use it to maintain a goatee or mustache as well. Panasonic pop-up trimmers work the best out of all in my opinion; they’re really sharp, don’t pinch the skin and require fewer strokes to get all the hairs. I also like that they’re wide enough and have a straight edge, much better for detail work than a rounded one. As for negatives, the trimmer sits perfectly perpendicular to the shaver and in order to be effective when cutting, you must hold it at a sharper angle relative to the skin. This makes it a bit less practical compared to other Panasonic shavers where the trimmer is tilted forward when fully extended. Also, if you hold the ES-CV51 trimmer perpendicular to the skin it tends to wobble during an upstroke, so you’ll definitely have to tilt the shaver a bit. Overall, it’s really good and the downsides are somewhat normal for s shaver of this size. The Panasonic ES-CV51-S is extremely easy to clean. I personally never felt the need for a cleaning station with any Panasonic shavers and this one is no exception. There’s the included brush that you can use to quickly remove most of the hairs after a dry shave. However, I recommend this method only if you’re really constrained by time. Also, make sure not to use the brush on the outside of the foils as you can damage them very easily. What I always do (and also strongly recommend) is to use a bit of liquid soap and warm tap water. It takes less than a minute for a thorough cleaning that will ensure proper hygiene and performance. Once you’ve completed your shave, with the razor turned off, wet the shaving head and apply a bit of liquid soap on the foils. 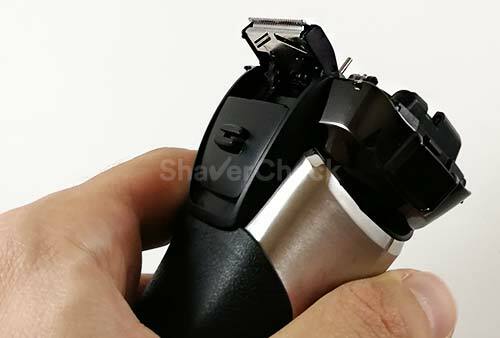 Holding the shaver upright, press and hold the power button for 3 seconds. This will activate the so-called sonic cleaning mode. The blades will begin to oscillate at a very high speed, lathering the soap and dislodging any stubborn debris. The cleaning mode will be deactivated automatically after 20 seconds or you can do it sooner by pressing the power button. Press and hold again to activate the sonic cleaning mode and begin rinsing the shaving head under warm tap water. The cleaning mode will also prevent splashes. Turn the shaver off, remove the foil frame and rinse it thoroughly with water. Do the same with the inner blades. After that, pat them dry with a clean towel and let them air dry before storing the shaver in a cabinet. The use of soap and water will also remove any form of lubrication, so it’s important to lubricate the blades regularly. My recommendation would be to do it after every cleaning that involves soap and water. I personally do it right before I shave as the blades and foils must be dry. Just place a single drop of oil from the included bottle on the outside of each foil and let the shaver run for a few seconds. This will allow the lubricant to disperse evenly and coat the blades. If necessary, gently pat the foils with a paper tissue to absorb any excess oil. That’s it, you can now go ahead and shave as usual. If you run out of lubricant, you can simply use sewing machine oil or any other brand of clipper oil (the one from Whal also works very well). Another option that I highly recommend is a lubricant spray like Remington Shaver Saver, especially when the blades will start to feel a bit dull. A common problem with newly released electric shavers is buying replacement foils and blades. They’re either too pricey or unavailable. The good news is that in the case of the ES-CV51/ES-CV70 and all the latest Arc 5 models, the foils and blades set is available on various online stores. The part number of the combo pack is ES9036 (sometimes listed as WES9036). However, compared to the previous Arc 5 generation, the cost of one set is very high, at least for now. It will eventually go down, but until then you’ll have to shell out a pretty penny to get one. It’s interesting to note that while the outer foils are completely new (part number WES9177 or ES9177), the two inner blades are the same ones used by the first and second generation Arc 5 (part no WES9170). 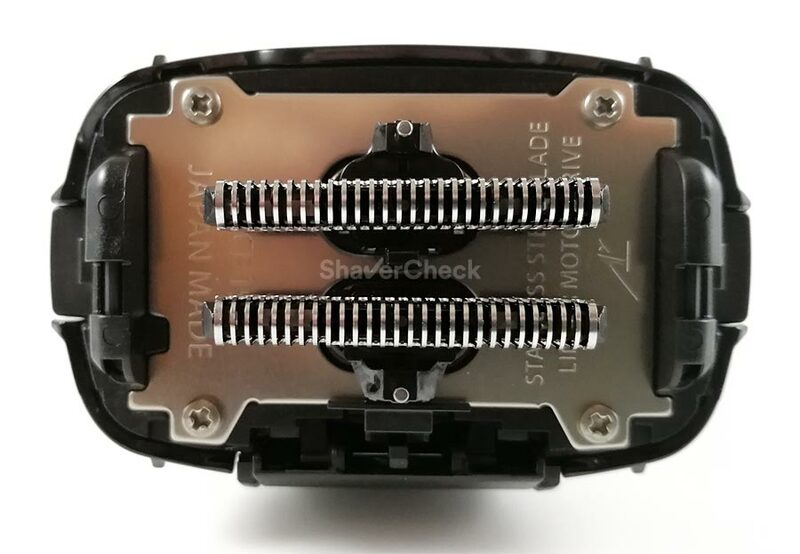 Another option would be to buy the older foils (and blades) used by the second generation Arc 5 shavers like the ES-LV65-S. Those can be bought for less money and will fit the ES-CV51/ES-CV70 just fine. The part number for the set is WES9032P. But do keep in mind that they don’t have the comfort rollers and in my experience they’re not as comfortable, even though they shave just as close. This could be a viable solution until the price of the new replacement foil goes down. 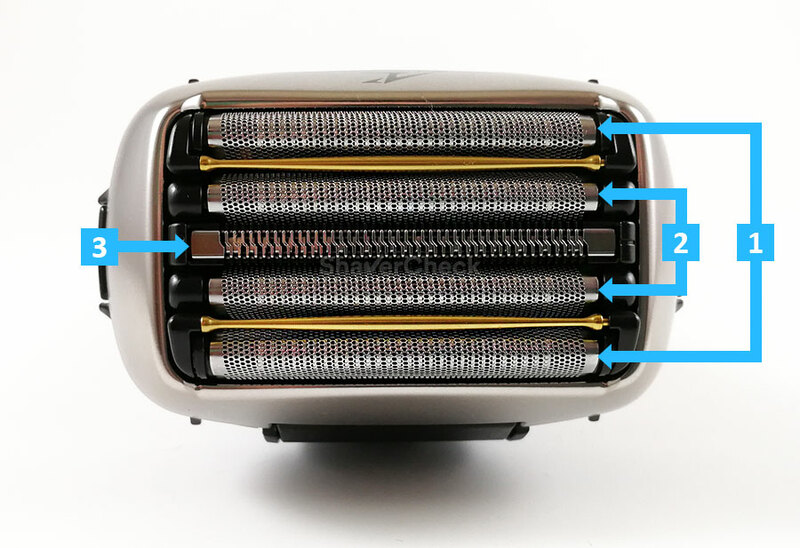 According to Panasonic, the foils must be replaced every year and the inner blades every two years, but this will depend of course on various factors, like how often you shave, how coarse is your beard and how well you take care of your razor (cleaning, lubrication). 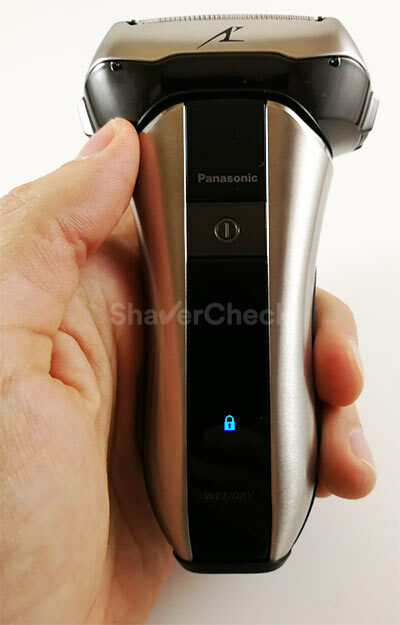 Concluding this Panasonic ES-CV51-S (ES-CV70-S) review, I can confidently say that this is by far the best compact/travel shaver out there right now. There’s simply no comparison between it an the rest. However, unlike your typical compact shaver that is only good enough for occasional use, the ES-CV51/ES-CV70 can represent a great option as your main shaver. It really is that good and there are no major drawbacks to using it compared to a regular Arc 5 shaver. In fact, in certain areas it’s even better: smaller footprint, smaller shaving head, cheaper to buy and it comes in a premium metal finish, unlike most other Arc 5 models. The hard travel case is another bonus; again, only the top of the line and much more expensive ES-LV9Q and ES-LV9CX come with one. If you don’t want to spend a lot of money on those and since the cleaning station is not really necessary, the ES-CV51 is a perfectly good alternative. If you also travel a lot, you’ll really appreciate its compact size. It will certainly be my new travel shaver from now on. 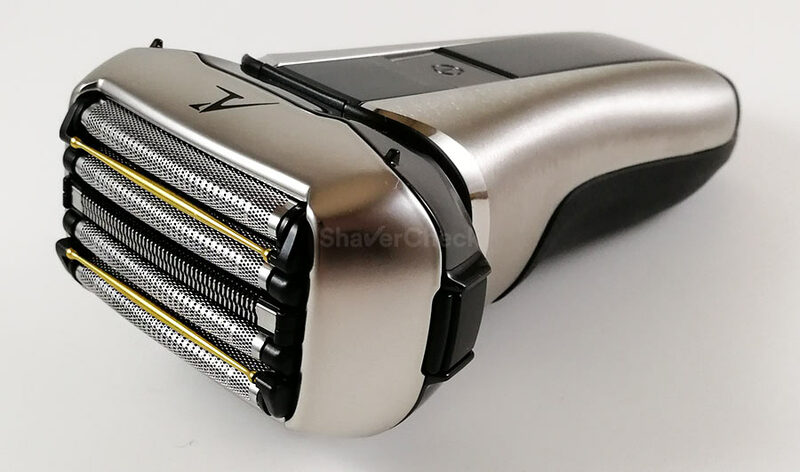 As mentioned in the performance section of the review, the ES-CV51 excels at providing a really close and fast shave and for the most part it’s comfortable as well. It works the best on shorter facial hair as it tends to sometimes miss longer, flat-lying whiskers and requires multiple passes to get those. So if you usually shave daily or every other day, this could be a great shaver for you. If your skin isn’t overly sensitive, you’ll be fine as well. Using a shaving cream really makes it extremely comfortable so that’s also an option. In my experience it was comfortable enough when used dry and even better with a pre-shave. However, if you don’t necessarily need a compact shaver, there may be other options that would suit you better than the ES-CV51. This is the best-selling Arc 5 model from the previous generation and it still represents a fantastic option, especially now when it can be found at excellent prices. Moreover, the replacement foils and blades are cheaper than the ones needed for the ES-CV51. 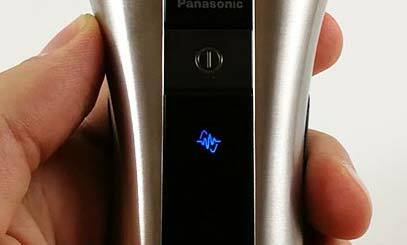 If you don’t necessarily need a compact shaver, the Panasonic ES-LV65-S will provide a similar shaving experience but for less money. Also, you’ll have the option to deactivate the shaving sensor. As for downsides, the ES-LV65-S is a bit more aggressive during a dry shave and despite being very solidly built, it doesn’t have a metal body. The Series 9 is the direct competitor of the Arc 5 and since there isn’t a compact version of it, we’ll check out the 9290cc which is usually the best pick (availability and price). The Series 9 is the most comfortable shaver you can currently buy and likely the best option for men with very sensitive skin. It’s also a lot better than any Arc 5 models at shaving longer hairs. If you don’t shave regularly (as in more often), have very sensitive skin or your facial hair tends to grow parallel to the skin and in different directions, I think the Series 9 would be a far better choice. Great review there! Just curious how often do you clean the shaver? Do you do it after every shave? Thank you for your comment, I really appreciate it. I personally clean the shaver after every use with liquid soap and water. It literally takes me less than 30 seconds, so I do it after every shave. Hi, using ES-CV51 for more than a month, as travel shaver as well as main when back home. I have thin hair, and do dry shave so I was really surprised that battery lasted about 3 weeks in my case. Very compact shaver and case is great, shaver feels well protected in it. So far, really happy with my choice, do not miss flex head so much, even I feel to be in better control with fixed head. Try to clean as suggested with liquid soap but only once per week, seems like enough in my case. That’s great to hear — it really is a fantastic shaver. If you use it dry, cleaning once a week with soap and water should suffice. Thank you again for taking the time to share your experience. Terrific review as usual. Really enjoyed reading this. Sounds like it is not a worthy upgrade from LV9N model, rather targeting new to Panasonic shavers. It seems (from your description) that we have similar type hair. One disappointing thing with Panasonic for me has been just how short lived the blades are. I clean them after every shave but after 6-7 months their performance deteriorated significantly to the point of having to replce both blades and foils which made the whole difference in my shaves. Very very expensive though. On a similar but a separate topic, I’d be really curious to hear what your thoughts are on a new Philips S9000 Prestige model? This is the latest and greatest from Philips. I am not big fan of rotary shavers as they never worked for me and I did give them a go fair bit over the past 20+ years. I was asked to take it for a ‘spin’ for a few months and so far it has blown me away! I have to say that it provides the closest shave I have experienced in my life, which includes DE wet blade shaving. It comes with self sharpening V-shaped blades covered in nano-particles. Philips claim that they take at leadt 2 years before they need to be replaced. I’m yet to validate that obviously but afrer a few months – so far so good. It also provides very comfortable shave (just make sure you do not press hard at all against your face – very gentle circular motions do all the trick). Cleans up my neck best of all shavers (Panasonic ARC5 or Braun 9). I’m not a big on promoting products but I feel this shaver deserves some of your airtime as it truly is amazing. It also comes with the wireless charging pad which is a bit of a gimmick to be honest. Anyways, looking forward to your thoughts and hopefully a review at some point. You are right, the ES-CV51 or any of the latest revision C and D Arc 5 are not a worthy upgrade from the previous LV9N/LV9A models. If you already have one of those, definitely not worth the upgrade. I’ve also experienced a decrease in performance with my Panasonic shavers after one year of use or sometimes even less. However, I’ve found a cleaning and lubricating spray to work wonders in this situation. I use a Remington Shaver Saver spray and it makes a world of difference, so I highly recommend giving it a try before buying new Panasonic foils and blades every 6 months — they’re really pricey. I’ve actually been very intrigued by the S9000 and your experience with it just made me even more hyped. In the past I’ve tried lots of rotary shavers, including Philips Norelco’s high-end models that cost a ridiculous amount of money only to get a mediocre shave, so I’m really curious about this one. I will definitely get it, hopefully very soon. Thanks for your reply Ovidiu. I do use ShaverShop’s spray which is medical grade silicone lubricant specifically made for electric shavers. Longetivity is still <1yr sadly. Braun lasted me longer in the past although I haven’t used 9 long enough. I returned my within 60 days as my shave was not that different to 7 and I had an eye for new Panasonic, which is mich better imo. My experience with rotary has been very mediocre as well in the past to the point I gave up altogether after trying initial Series 9000 back in 2014. Always left that ‘sandpaper’ feel on my skin. It feels like Philips got tired of playing catch up game with Braun and Panasonic on the shave closeness and redesigned the shave head, which is made of metal now as well. At least in my case it made a complete 180 turn. Closer than Braun definitely and I’d say you can’t tell the diffrenece between blade, Panasonic and S9000 Prestige. A word of advice once you get it, it takes a few weeks for the face to fully adjust. Never press harder than a weight of a blade so let them just glide over the face making circular motions around the face and neck. I prefer wet shave with preshave oil and proraso shave cream. With LV9N and Philips in my bathroom I instinctively now pick up Philips mainly because it’s sooo much quieter, never gets hot, and seems to be more comfortable for my skin. 1st world problem I know, but for a guy that needs clean shave every day (work required) this is excellent choice. Enough of my opinio – looking forwards to yours! Thank you, Miki. I really appreciate your input. I already have a review in the works, but the S9000 will definitely be the next one. 1. I’ve been shaving with a professional grade Wahl T-Blade trimmer for years, mostly because it allows me to shave dry without causing any irritation, but the compromise is that I don’t get a close shave. 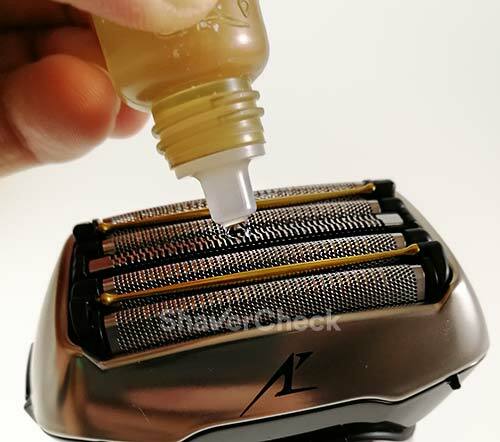 I haven’t used an electric shaver since I was a teenager – do you know if this shaver will give me a closer shave than the Wahl trimmer that I’ve been using? 2. Are there any downsides to buying this here in the US, where it’s not readily available? (Other than through a Japanese seller on Amazon). Alternatively, do you know if a US version of this shaver is planned to be released anytime soon? Again, thank you for all of the detailed information that you provide, it’s extremely helpful. Thank you for your comment, that’s very kind of you. Glad you found the information useful. This shaver (and any other high-quality electric shaver) should provide a significantly closer shave compared to your Wahl trimmer. It is after all a hair clipper and it’s mainly intended for detailing/shaping. As for the second question, the price would be the main downside with Japanese sellers, especially with these latest Arc 5 models. I would also contact the seller beforehand and ask him specifically about support and warranty in the US. Unfortunately I have no information about an official US release. To be honest, I was expecting the ES-CV51 variation that is sold in Europe to be available in the USA by now. But so far Panasonic seems mainly concerned with promoting its third generation Arc 5 line in Asia and Europe. I guess Panasonic shavers are still nowhere near as popular as Braun in the USA. Great site and great reviews Ovidiu! Just ordered the ES-CV51 from Amazon.de, and the ES-LV9Q is on the way as well, partly based on your reviews, but I already use an LV9N, so the Q is just an upgrade/back up. 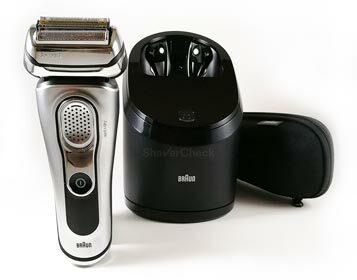 I also periodically use a Braun 9290 occasionally, and an S9000 Prestige (I know – shaving is sort of a hobby, but I’m not a reviewer except on Amazon). I’m also a traditional wet shaver of several decades, with enough artisan soaps, blades and DE razors to last several lifetimes. Agree with everything you noted about Panasonic and Braun. I’ve not noticed a difference in comfort level with either the Braun or Panny, but my electric shaves have the same prep, pre-shave and lather as my DE shaves, and the Panasonics are the only electrics I’ve found that give me a shave comparable to a DE blade. The Philips is definitely less comfy, but the necessity of multiple across-the-grain cycles with a rotary contributes significantly I’d guess, even with the new heads. 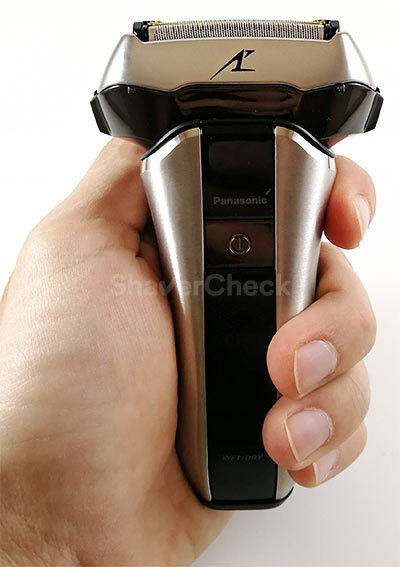 Looking forward to trying the mini-Panasonic traveling – I’ve not really found an ideal travel shaver, and the super easy cleanup with the Panasonic makes it an ideal candidate, plus the advantage of the same shaving head in a compact size. Thanks for the writeups! Many thanks for your kind words, I truly appreciate you taking the time to share your experience with the trio, arguably the best electric shavers currently available. I think you’ll love the ES-CV51, it’s a fantastic little machine. I’ve been using it as my travel shaver for the last few months (along with some travel size shaving cream) and it’s been just great. Thanks Ovidiu – looking forward to it! Electrics have definitely come far compared to my original corded Remington, and although my DE pals generally look down on electrics, they are usually comparing their memory of that old Remington. I’ve found the current crop of electric shavers every bit as comfortable, almost as close (insignificantly different), faster, and safer for the average shaver for the daily shave compared to a DE. I still sometimes use a DE, but more often find an electric in my hand, and find I no longer need to trade quality for convenience. I can totally relate to this, Allan — 15 years ago I’ve switched from cartridge razors and canned foam to DE razors and nicer creams and soaps. This made a big difference, but it was still not good enough. I then tried an electric shaver and never looked back. I only kept an Edwin Jagger DE89 as it’s very mild and it was actually my very first DE razor, but I’ve only used it once or twice in the last few years as I would still break out afterward. Well, at least I still get to use my shaving creams. I tend to wet shave with my Panasonic shavers and grab a Braun when I need a quick dry shave. This seems to work best for me. Thank you again for your thoughtful comments, I’ve thoroughly enjoyed reading them.